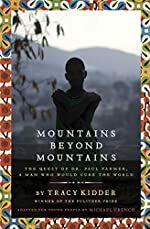 Mountains Beyond Mountains: The Quest of Dr. Paul Farmer, a Man Who Would Cure the World by Tracy Kidder; adapted for young people by Michael French. Review: There are many people suffering, and dying. Why? All this is happening because of lack of medicine, and treatment. Your family, and neighbors are all sick, and there is no help. The conditions in the developing countries are only getting worse instead of getting better. All seems dark and lost, but a brave, intelligent, and giving man spends his life helping in a few countries. Tracy Kidder wrote Mountains Beyond Mountains, a book about a world that needs attention, and that world is Earth. Will the people get help? Is there mercy, help or does anyone even care? Well, this is what Paul Farmer does; he helps and cares for everybody, especially the poor. Most people in rich countries take a lot for granted, but what we don't know is that we are the lucky ones, and should help. We take things like school and medicine for granted, also we don't even think there could be places in the world without these "luxuries" living horrible and terrifying conditions that no human being ever deserves. Paul Farmer goes to one of the best colleges in the U.S.A. He have a beautiful life in peace, but he chooses not to be rich or prosper and instead he goes to other countries in the world that need help. All looks lost, but with his help will the world be cured? Mountains Beyond Mountains is a great book. It feels like you are actually there breathing, but it is also kind of sad. Paul Farmer is an interesting character. He is a person anybody would want to be like. He is kind, respectful, and generous. Plus he has such devotion that he only sleeps 4 hours a night because there are people who need his help? The settings are interesting because it takes places in many different countries, so readers gain a respect and understanding of other parts of the world. Every person should read Mountains Beyond Mountains because it shows how one person can change the world. This amazing and inspirational book is appropriate for middle school and high school readers because of the challenging content. I yearned to keep on reading to find out if Paul Farmer would cure all the people. All in all, Mountains Beyond Mountains is an excellent book because it is so well written that readers feel like you are there experiencing the pain of others and living in a world that no wealthy country can imagine. We would like to thank Random House for providing a copy of Mountains Beyond Mountains: The Quest of Dr. Paul Farmer, a Man Who Would Cure the World for this review. Have you read Mountains Beyond Mountains: The Quest of Dr. Paul Farmer, a Man Who Would Cure the World? How would you rate it?